"A remarkable man who is insufficently recognized these days"
Photo: Martin Shaw, wearing his habitual riding outfit, flanks a group of singers with Ralph Vaughan Williams at the 1935 Three Choirs Festival, Worcester. very strongly that the great purpose of music should be to aid the cause of Humanity, and that we should regard it, therefore, as being in its nature at least as much social as artistic. His published works include songs, cantatas, plays, anthems, pageants and much editorial work which passed on folk song to the next generation. This included the familiar hymn books The English Hymnal and Songs of Praise, as well as The Oxford Book of Carols. Shaw was someone who saw music in a wider, social context, as a means for creating social change. He was a great champion of Folk Music, the music of the Common Man, and in this he was not only a leading pioneer of the cause of English music, but also joining in the campaign for social equality. Society was still very unequal at the start of Martin's musical career in 1900. The result of the social changes that took place in England in the early part of the 20th Century are so much a part of our life and culture today that we tend to take them for granted, but whilst the cause for social change had come from reformers and authors such as Charles Dickens in the Victorian era, their ideas were yet to be fully implemented. At the start of the 20th Century, the classes did not mix, and if you had no money your prospects were grim. Martin knew this all too well from his own personal life. In 1903, Martin and Edy Craig (sister of his friend Edward Gordon Craig) had become engaged. Sadly the marriage did not go ahead, one reason being that Martin had no fortune and no regular income. With no money, he and Edy would have been excluded from Society, something that was unthinkable at the time. Martin continued, as he put it, to be 'starving along' until 1908, when his appointment as organist and choirmaster for St Mary's Primrose Hill in London gave him financial stability. And in 1916 he did marry, not Edy (though they always remained friends), but a young music director called Joan Cobbold. Martin's work for the cause of Humanity never did earn him a fortune, but the arrival	of the Welfare State after World War 2 was the result. "Please let me. I feel so badly that others who have done so much finer with their musical lives should ease my conscience [sic] ...as Ford says to Falstaff I know it ought to be the other way round." Martin Shaw was born at 3, Camberwell Green, London in 1875. In 1880s his family moved to Hampstead, where he lived until 1901. He studied at the Royal College of Music under Stanford and Parry where he formed life-long friendships with Gustav Holst, John Ireland and Ralph Vaughan Williams. During the 1900s he lived in Chelsea, and was part of a bohemian set of artists including Edward Gordon Craig, James Pryde, Augustus John and the poet WB Yeats. In 1906 and 1907 he toured Europe as Music Director for the dancer Isadora Duncan. 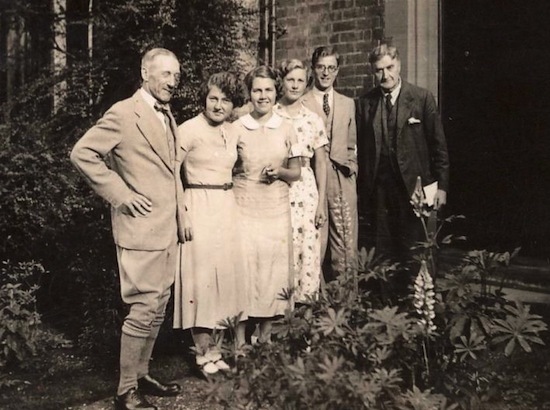 In 1908 he returned to Hampstead where he lived with his family until 1934. After some years living in Essex he retired to Suffolk, eventually moving to the Suffolk coastal town of Southwold where he died in 1958. His ashes are interred there in St Edmund's churchyard. The conductor's room at St Martin in the Fields is named after him.